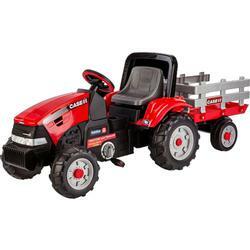 Tough Performance Chain drive, pedal tractor geared for all-terrain. Get Fit Exercise and fun; for body and imagination. Drive Chain Drive easy to pedal tractor. Safety Heavy-duty bicycle chain and sprockets enclosed to protect fingers. Wheels Large, heavy-duty construction tractor wheels operate on grass, dirt, gravel or pavement. Haul It Extra-large stake-side trailer; 21.5? x 14.5? x 9.75?. Room to Grow Large, adjustable bucket seats with roll-bar. Ages 3 - 7 years.